Games Workshop's sci-fi universe gets its own action-RPG. Too much games-as-a-service cruft gets in the way of a potentially decent action-RPG. What is it? An ARPG set in the 41st millennium. 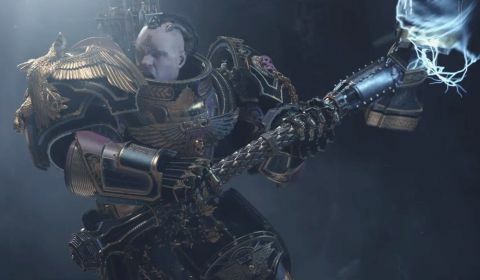 Warhammer 40,000: Inquisitor—Martyr, which I am going to just call 'Martyr' from now on if that's cool with you, is a rare action-RPG set in the 40K universe. It seems odd nobody's done 'Warhammer plus Diablo' before now, but that's what Martyr is. The inquisitors are 40K's secret police who investigate heresy, and an odd choice for a game of killstreaks and loot rather than mystery and interrogations. You choose from three flavors of inquisitor—crusader, psyker, and assassin mapping onto warrior, wizard, and rogue—and then plunge into a giant spaceship monastery called the Martyr which has been taken over by cultists and daemons. Abilities live on a hotbar determined by gear like in Guild Wars—swap weapons and you've got four new attacks. There's another slot for an ability determined by your armor, and one for equippable grenades/mines/force fields/tiny fingerlasers. My crusader has a jetpack on his power armor and usually gets about with a greataxe that lets him do a charge and a couple of different area-attacking swings. My assassin, meanwhile, creates holograms of herself to distract enemies and carries a sniper rifle that does both aimed shots and a from-the-hip multishot while backpedaling to create space. This is fine when you hit a combination of gear you like. But some of them are a bit rubbish. The shotgun, for instance, is just a convenient way of tickling several people at once. The thunder hammer lacks the kind of Thor-at-the-Olympics spin attack you'd want from one. That's a problem because it's impossible to change loadout mid-mission. You carry two weapons and can switch by pressing Tab (though doing so resets your cooldowns, making it impractical mid-fight), and no matter what you pick up from the incongruous chests along the way you can't use it till the next mission. More than once I went to try out some new gun or mine, realized it was junk, and then had to churn through the rest of the level making do with it anyway, struggling to slice at the lengthy health bars of greater daemons and dreadnoughts. It doesn't help that you don't have abilities beyond the ones you get from gear—skill points just buy tiny passive bonuses, +1.5% critical chance kind of things, and only when you unlock new equipment do you get new abilities. I spent a lot of time sticking to reliable combinations even as they grew stale, feeling punished whenever I experimented. Here's something I liked: you gather a whole crew of support NPCs, including a tech-priest who keeps telling you the odds, a sarcastic rogue trader, and a cranky space marine who clearly wishes he was the one charging into battle (it would make more sense if he was, honestly). Their banter lightens a deliberately dark game, though I wish they could agree on the pronunciation of jargon instead of all saying it differently. It's in service of a story that takes you beyond the Martyr and across an entire sector, dealing with rival inquisitors and planetary rebellions. There are a ton of sidequests and other things to do, which you'll need to engage with because eventually, even if you knock it down to story difficulty, you'll hit a wall. All equipment has a power rating, and your overall rating from adding it together tells you whether you're ready for any given mission. If you're underpowered you suffer damage reduction and a bonus to damage taken. It's a literal gear check that has you rushing to the shop between missions to buy or craft slightly better implants to keep up with the treadmill. It's frustrating because when it's good it really is good. If that mention of crafting seemed to come out of left field, wait till you hear what else Martyr has going on. There's a PvP mode, co-op (though only in sidequests), sidequests strung together into multi-part side campaigns called investigations, challenge missions that let you alter their random design with tarot cards representing different loot and difficulty variables, three currencies (credits, glory, and fate), endgame warzones, limited-duration global events with lootbox rewards (no microtransactions, though), and coming soon, seasonal content. There's so much going on it feels like Martyr wants to be both Diablo 3 and Destiny. It's a bit much, to be honest, and some of it's clearly redundant. The waiting times on multiplayer make it pointless unless you're going in with friends and those friends will all have to have played through the entire first act to unlock the relevant modes. Actually, there's a lot you have to play for 10 or 20 hours to see, whether it's systems like the underused moral choices, of which there are only a few in the entire campaign, or the vehicle sections that let you drive a tank and a mech. In some investigations I got to make decisions that altered missions like whether to hire hackers or psychics to scope out an underhive before going in, but too rarely. All this cool stuff is used and tossed aside, and to get to it you have to fight a lot of samey enemies in dark corridors where the camera won't show you what's going on. It's frustrating because when it's good it really is good. There's a cover system that feels right when you're hunkered down with a rifle lining up an aimed shot, which involves a targeting system like a spinning roulette wheel, which stops on the body part that wins a bullet. Pillars and other bits of level furniture fall to pieces once the bolter rounds start flying. They patched the jetpack and now it's a proper whooshy slamdunk. Everything's technogothic, with automated doors and even your storage locker having the human faces of lobotomized criminals or clones who've been cyborgized into service. There's a quote in the 40K books that goes, "The universe is a big place, and whatever happens, you will not be missed." That's what Martyr makes me think of. A big universe of stuff, but spread so thin the good bits are easy to miss.